Built at Douglas. Delivered to the U. S. Army. Disassembled and ferried overseas to Australia and reassembled. Assigned to the 5th Air Force. On February 19, 1944 assigned to the 312th Bombardment Group, 386th Bombardment Squadron. 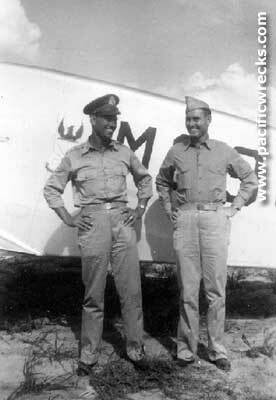 Tail letter F.
This aircraft was shared by two pilots: Frank C. Hogan and Stanley M. Keeton. 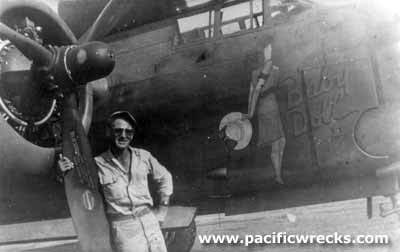 The right side was nicknamed "Baby Doll II" by Hogan with the nose art of a woman in a dress holding a hat behind her. 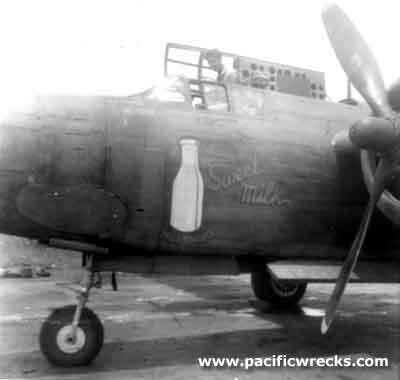 The left side of the nose was the nose art of a milk bottle and the nickname "Sweet Milk Hillsburo, TX" (Keeton's nickname and hometown). On May 15, 1944 took off from Gusap Airfield piloted by Keeton on a bombing and strafing mission over Dagua Airfield. During the attack, this A-20 was hit by anti-aircraft fire, suddenly nosed over, crashed and burned immediately. 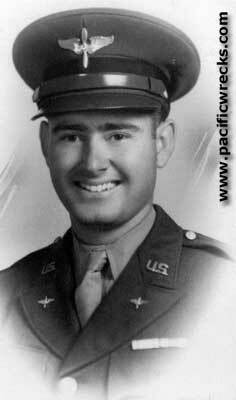 "On that day May 15, 1944 I was nursing a sprained wrist and on the doctor's advice I was not to fly. Stan had been wanting to lead my 'A' flight and so he was assigned to take my place. I wondered for many years why him and not me, normally I would have been leading that flight that day. Call it fate I guess. 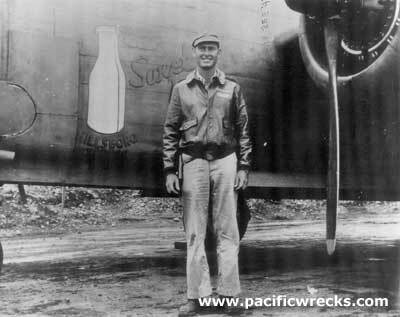 From reports that I had at the time, from his wing men, his plane was hit on his strafing and skip bombing run. I was told that he tried to get out and it was reported that it appeared that he had pulled the rip cord of his chute, it looked like the chute was trailing the plane down and into the trees. However, it could have been trailing smoke. Now, if this was the case, there couldn't be any escape and at that speed, no survivors. All this time we all thought that he and his gunner couldn't possibly survive the crash. This story that you have forwarded puts a new direction to the crash. With the terrain around the and the trees at the end of the runway I don't see how it was possible, but funny things happen with no explanation. It was tough putting his effects together for shipment home." At the end of the war, the remains of the crew were recovered from the crash site. 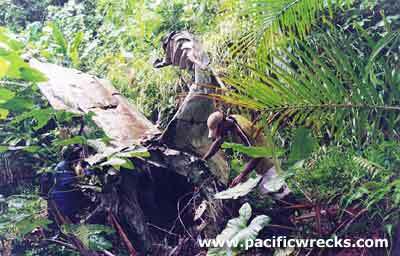 During 1972, more remains were found and recovered by the Assistant District Commissioner (Kiap) for East Sepik Province David Pennefather. It is unclear if these additional remains were added to those originally found. Both crew were declared dead the day of the mission and both are buried at Manila American Cemetery. Keeton at Plot D Row 1 Grave 195. Turek at Plot B Row 2 Grave 138. 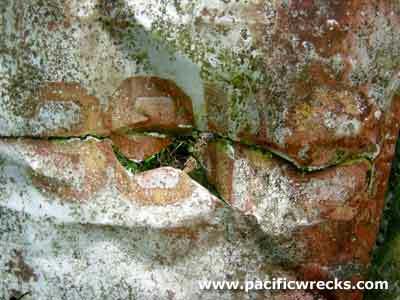 The wreck consists of the tail of the aircraft, broken off, the "club" marking of the 386th Bombardment Squadron is still visible on both sides of the tail, and the U. S. Army serial number. Nearby is a wing center section, engines and remains of the cockpit and nose of B-25D "Tin Liz" 41-30074 that crashed six days later. "The wreckage is still there in a Sago Swamp. According to the locals, the crew survived the crash, and were executed by the Japanese, and the aircraft was burned. A local man had a ring he found near the wreckage that belonged to one of the crew, and wants to return it to the relatives in the United States." "I also visited the A20 43-9113 when I was at Dagua. It was several hundred yards away from B25 41-30074. At the A20 site, the tail was at the base of a steep hill and as you crept up the hillside, the fuselage, wings and engines were strung up along the hill." Thanks Andrew Keeton and Hank Eales for additional information.